Stock photo of rays of sunlight streaming through the forest near Virgin Falls along the Tofino Creek, a transition area of the Clayoquot Sound UNESCO Biosphere Reserve, Vancouver Island, British Columbia, Canada. 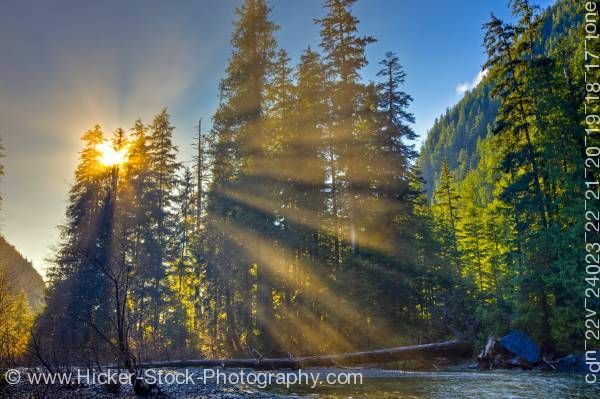 This stock photo shows rays of sunlight streaming through the forest near Virgin Falls along the Tofino Creek, a transition area of the Clayoquot Sound UNESCO Biosphere Reserve, Vancouver Island, British Columbia, Canada. Biosphere Reserves are in essence global laboratories for sustainable development. They combine the three functions of conservation, sustainable development, and support for research, education, and training. The original inhabitants of Clayoquot Sound, the Nuu-chah-nulth people, have a guiding philosophy of Hishuk-ish ts’awalk. This means everything is one, which recognises that communities, cultures, economies and environments are interwoven and impact one another.